The Matrix of Evil is classic Alex Jones documentarianism (that might not be a word) at its finest and we’re proud to host this insanity on our network. 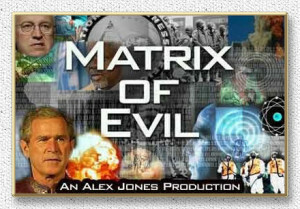 Featured in this full length documentary are highly radical views critical of the United States Government and the alleged powers who rule the world stage. Released in the era of the introduction of the Patriot Act post 9/11, this documentary was made to open eyes, challenge perceptions, and exercise the freedom of expression of its maker. The use of crisis and fear to control the population of developed countries is cited in the film. The “Patriot Act” was discussed and shown to be far from patriotic. Terrorism is defined and it’s also discussed how anyone could fall under the definition of a terrorist as outlined by the USA Patriot Act. The move of society to a prison style economy was also talked about in this documentary. Cynthia McKinney was also featured in the Matrix of Evil in a powerful speech in which she went on a verbal dressing down of the political power structure. Tracking people like sheep and cattle was talked about by Alex Jones. It was also discussed how tracking cars and locking them into the GPS system was discussed years before implementation. Enjoy The Matrix of Evil Documentary!